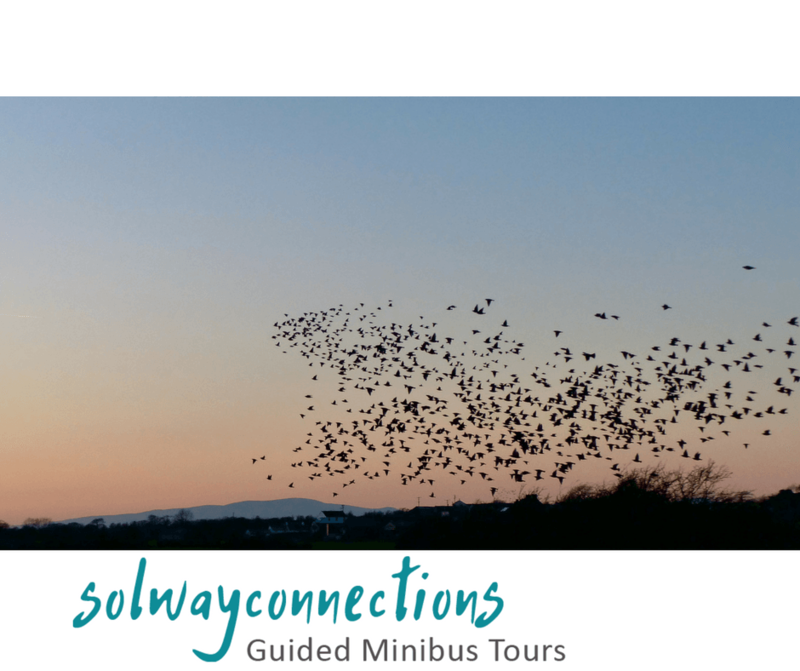 Solway Starlings beginning to flock as night time arrives. Just before 4.00pm on a cold, clear winter evening we arrived at the Easton junction on Burgh marsh near the Solway estuary in Cumbria, UK. Having been told that as night arrived starlings were beginning to gather here in large numbers in the trees and on the telegraph wires, we wanted to try and photograph a starling murmuration with a sunset backdrop. Yes the birds were there, not as many as last year at the nearby Watchtree Nature Reserve when it was thought that over fifty thousand birds were roosting and not as many as the hundreds of thousands seen in previous years at Gretna Green, but there was the beginning of a Starling murmuration. The birds took to flight as the light began changing. We snapped a photo of them beginning to flock together with a backdrop of Criffel mountain in Scotland and then they headed south east only occasionally looping back round towards us, but not so that we could get another photograph. They stayed low in the sky, and did not bunch up tightly nor form shifting shapes in the sky as we have seen in previous years. Without warning the birds suddenly dropped down into fir trees. Perhaps it was just too cold for flying around. The number of Starlings might increase over the winter months - there may still be the chance later in the season to get that photograph.